Citing popular demand, Kellogg's is bringing back Frosted Strawberry Milkshake Pop-Tarts starting this month at retailers nationwide. Available for a limited time, the toasted pastry features a creamy, strawberry-flavored filling that's meant to taste like a strawberry milkshake. According to the brand, the returning flavor has been the "most highly-requested flavor among fans on social media." 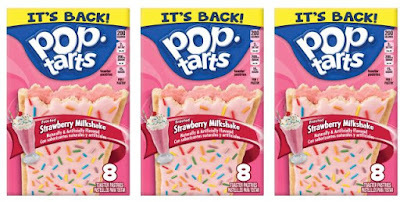 Frosted Strawberry Milkshake Pop-Tarts were last seen five years ago. Apparently, while you can certainly toast them up like other Pop-Tart flavor, the best way to eat them might to chill them in the freezer before having at it.